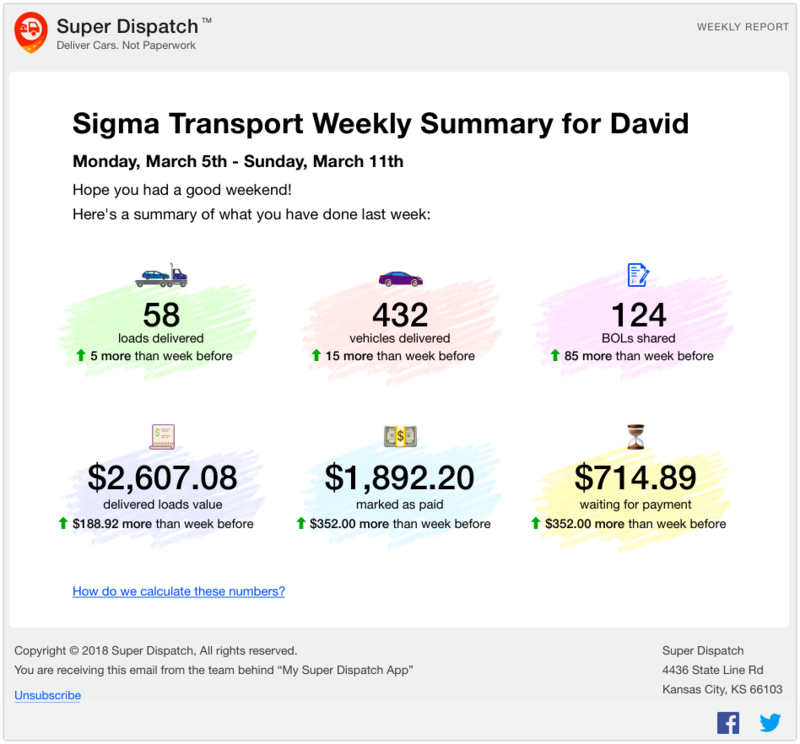 Weekly driver activity report emails are designed to give visibility to drivers about their weekly performance. This should help drivers to understand how they did in comparison to the week before and track their progress. Weekly driver activity report emails are sent every Monday. Loads Delivered - includes all loads delivered by driver (including billed, paid, archived and deleted loads) within last week. Vehicles Delivered - sum of all active vehicles of loads delivered by driver (including billed, paid and archived loads) within last week. BOLs Shared - shows the number of times driver sent BOL via email and fax that were successfully delivered to the recipient within last week. If BOLs were not successfully delivered, then we do not count it. Delivered Loads Value - shows the sum of all prices for loads that were delivered by driver (including billed, paid, archived and deleted loads) within last week. If any load has missing price information, it's not calculated. Also, if loads have Broker Fees in it, that amount is subtracted from the entire value. Marked as Paid - shows the sum of all prices for loads that are marked as Paid for loads that were delivered (including billed, paid, archived and deleted loads) within last week. If loads have Broker Fees in it, that amount is subtracted from the entire value. Waiting for Payment - shows the sum of all prices for loads that were delivered within last week, but not marked as paid (including billed, paid, archived and deleted loads). If loads have Broker Fees in it, that amount is subtracted from the entire value. If the driver wishes to no longer receive Weekly Driver Activity Report emails, they can easily use the Unsubscribe link at the bottom of the email. If you need Help or further assistance, please contact Support via chat on the bottom right of the screen or call 816-974-7002.